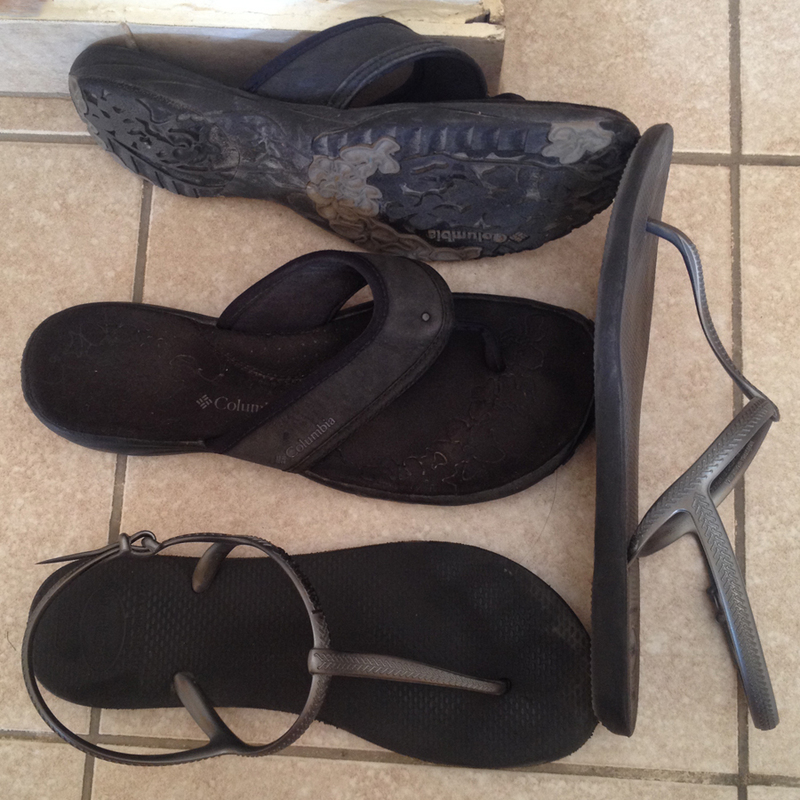 I traveled Central America, spending pretty much every day of my year in light weight flip-flop shoes with the bonus of an ankle strap — and been very happy with it. So I don’t know quite what was in my mind when I saw and bought a pair of Columbia ultra quality flip-flops. I think I thought they would be better for my feet, give me traction and support. The strap was set back far enough that I thought it would stay on my feet well. They were relatively flat and would not take up much room. While a nice sandal, the Columbia gave me no ankle support, so they were not a good choice. They were also very heavy. Heavy in my backpack — and heavy to lift on my foot with every step so walking in them made me tired. These shoes were not a good travel item. As I traveled, whenever I could leave some things behind for a while, they were left behind. But for the most -part, I carried them until I was in Croatia. At that point a nice traveler named Chen brought some of my stuff to Israel for me, lightening my load. As the warm weather came, I tried wearing them in Tzfat. They were not a wise shoe for the uneven stones of Old City Tzfat. In Tel Aviv Aviv I got some good use of these sandals. It was nice to break from my Bass sandals. I was able to walk across Tel Aviv several times in these. But that’s not enough reason to travel with a sandal. Arriving in Eilat and about to do a lot of walking in Petra, Jordan the next day I realized how heavy this sandal would be. I found a pair of Havianas that had an ankle strap. I am not a fan of Havianas due to their insane price and I never wanted to support them. (My other similar shoes were a different Brazilian brand.) However, I wanted to step lighter. So, finally, at the end of October, I gave my Columbia shoes to a friend who will find a friend who can make good use of them. (Not traveling.). My bag is lighter now. When I return to Tel Aviv, I will also be reducing my backpack weight by the weight of my Bass sandals. Their straps stretched beyond safety and they are not a good shoe for anyone to wear. I will have my Havianas, my light weigh sneakers, and my Aerosols. I’d planned to give up the Aerosols but they are a wiser shoe to keep than the Bass sandals.